An upgraded Russian Soyuz spacecraft carrying two cosmonauts and a veteran shuttle commander docked with the International Space Station Saturday evening after a two-day orbital chase, boosting the lab's crew back to six. Astronaut Scott Kelly's teenage daughter, Samantha, celebrating her birthday in Moscow, promptly asked her dad for an iPhone "so I can keep up with your trip." "I'm sorry, I didn't hear that," Kelly replied from orbit during a call from the Russian mission control center. Kelly did not reply as U.S. and Russian space officials laughed. 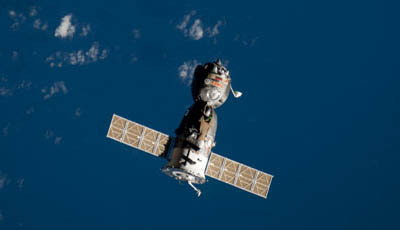 Flying an automated approach -- the first for the new Soyuz TMA-01M spacecraft -- Soyuz commander Alexander Kaleri, a space station veteran, rookie flight engineer Oleg Skripochka and Kelly docked to the Poisk compartment atop the station's Zvezda command module at 8:01 p.m. EDT (0001 GMT Sunday). A few moments later, hooks and latches engaged to pull the spacecraft firmly into place and after extensive leak checks, hatches were opened at 11:09 p.m. (0309 GMT). Standing by to welcome their new crewmates aboard were Expedition 25 commander Douglas Wheelock, Shannon Walker and Fyodor Yurchikhin. "It s great to see you all on orbit," Bill Gerstenmaier, NASA's chief of space operations, said during a traditional call from the Russian mission control center. "Space station really needs more than three. It's great that all six of you are there. Enjoy your time together, have a great time doing your experiments. Also, just enjoy your time on space station and look down at the beautiful world. It's great seeing your smiles, great seeing your faces." "Thanks a lot, Gerst, we're really looking forward to having the whole team together now and doing some great science," Wheelock replied. Kelly's twin brother Mark, who will command the space shuttle Endeavour when it blasts off in late February and who will join his brother in orbit -- a first in space history -- jokingly impersonated Scott, saying "Hey Mark, this is Scott. Six months is a longtime in space. So thanks for switching spots with me. Just hoping I can remember how to fly that space shuttle!" "Well, that's pretty funny," Scott deadpanned. A moment later, Kelly's daughter Samantha got on the line. "Hi, daddy, this is Sam," she radioed. "Hi, Samantha. Happy birthday from yesterday," Kelly replied. "Hey, I hope you had a good one. I also wanted to wish your sister a happy belated birthday from a couple of weeks ago since, you know, I'm wishing you one, too, and I didn't want to leave her out. Happy birthday, Charlotte, if you're listening." "I think it's still my birthday on the East Coast, so it's not belated," Samantha said. "Well, I hope you had a good one and you're still enjoying your trip." "I had one question for you." "Can I have an iPhone so I can keep up with your trip?" "I'm sorry, I didn't hear that," Kelly said. Earlier, Russian space officials said the new TMA-01M spacecraft, which features improved avionics, a new flight computer and upgraded software, performed normally with no problems of any significance. "Soyuz TMA-01M is a digital spacecraft, digital vehicle. As you saw today, it worked extremely well, it was an automatic flight, 100 percent automatic," said Vitaly Lopota, president of spacecraft builder RSC Energia. "The previous seven flights of Progress (unmanned supply ships) occurred utilizing this system. "Today, our engineers are working very closely to monitor how the systems worked," he said. "We look at the software, how it functions. There are always minor issues and corrections need to be made, but I think it is a giant leap forward from the analogue vehicle to the digital one. By using this vehicle, we are constructing a platform for a new vehicle that can be used in the future. We slowly introduce modernized systems and software to the Soyuz vehicle." Gerstenmaier congratulated his Russian colleagues on the successful launch, rendezvous and docking of the upgraded Soyuz. "I'd like to congratulate the entire technical team for a wonderful docking today, especially with the new digital Soyuz, with the new systems on board," he said. "It's no trivial task to have a flight as smooth and work as well as this flight did. It only shows how hard the technicians and specialists worked to make sure the software was exactly right. "So thy made a very difficult task look very easy," he said. "Congratulations to the technical teams. We look forward to a very exciting increment aboard space station." Wheelock, Walker and Yurchikhin have had the space station to themselves since three other crew members -- Expedition 24 commander Alexander Skvortsov, Mikhail Kornienko and Tracy Caldwell Dyson -- returned to Earth Sept. 25 after a six-month stay in space. At that point, Wheelock took over as commander of Expedition 25. Following a staggered schedule, Wheelock, Walker and Yurchikhin plan to depart at the end of November and Kelly will take over as commander of the Expedition 26 crew. Three fresh crew members -- Dmitri Kondratyev, Catherine Coleman and Paolo Nespoli -- are scheduled for launch to the station in mid December. Kaleri, Skripochka and Kelly, who blasted off from the Baikonur Cosmodrome in Kazakhstan at 7:10 p.m. Thursday (2310 GMT), plan to return to Earth in mid March.